FREE Free to all High School Music Directors and Group Leaders. 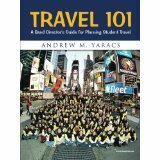 Travel 101 A Band Director's Guide for Planning Student Travel. Becoming a University Music Program Teaching Supplement! Written by Andrew M. Yaracs, retired Band Director of the Butler Golden Tornado Marching Band that marched over 350 in multiple Macy's and Tournament of Roses Parades. Andy gives you great first hand tips on travel, sample letters for parents, students, sign up forms, student contracts, and Parade Charting. Andy teamed up with Ameritours from his very first trip, and all of them thereafter including his Macy's, Tournament of Roses, Orlando, and many more! We were his Tour Company that this book is based on! Now you can experience the same level of Travel Planning and Tour Directing with Ameritours that gave Andy his travel planning. Simply complete the Contact Us form, and give us a quick note about your past and future plans and we will send you an E copy of Andy's book! Our history of successfully leading large groups of travelers for special events and conventions gives our clients the confidence that their itineraries are in good hands. From Major League Baseball Opening Days, inbound travel for New York City Parades like Macy's and Saint Patricks Day Parade, bucket list trips to Pasadena for Tournament of Roses Parade and much more! School Districts across the country have entrusted our company with the travel packages and care for our most precious clients, school students! From Pasadena and New York City, to Orlando and Chicago we've provided superior service from destination planning and full itinerary details to staging and on site supervision and Tour Direction. Some of the largest marching bands in the country have trusted their once in a lifetime experiences with us. We are with you from travel or arrival to getting home without breaking your budget with our fuel pricing guarantees and trip cancellation coverage.